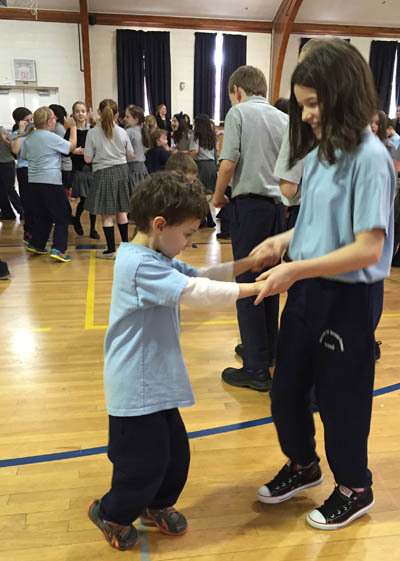 Students at Our Lady of Mount Carmel School in Doylestown have more fun than a regular school day as their Dance-a-thon raised $2,400 for Our Lady of Confidence School, the archdiocesan school of special education in Willow Grove. Kase Fenimore (left) dances with Shannon Raymer at Our Lady of Mount Carmel School’s Dance-a-thon for Catholic School Week, Jan. 30. 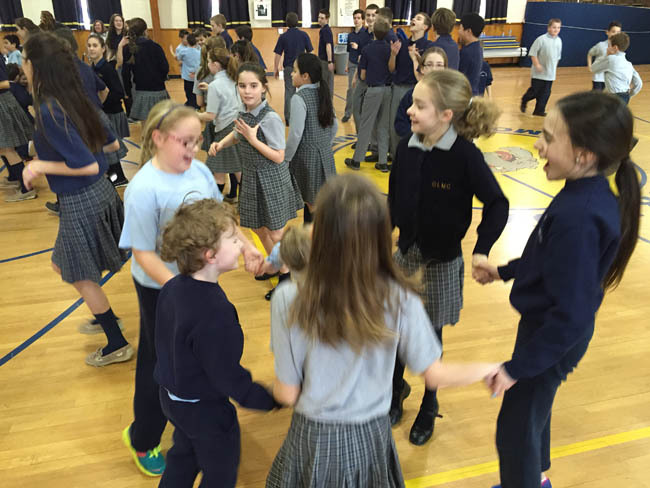 “Shall we dance?” That was the question of the day on Friday afternoon, Jan. 30 at Our Lady of Mount Carmel School in Doylestown as the school finished up Catholic Schools Week with a Dance-a-thon. All of the school’s 270 students in grades Kindergarten through eighth joined in the fun. Because it was a service project, there was a meaning behind the fun; in this case it was raising money to be donated to Our Lady of Confidence Day School, the special education school in Willow Grove. A little over $2,400 was raised, which will go toward buying iPads and cases, according to the principal. The Dance-a-thon went from 12:45 to 3 p.m., with kids dancing two grades at a time according to school secretary-turned-D.J. Katie O’Connell. “Let it Go,” as you might guess, was a hit with the little folks, and “Cha Cha Slide” and “Happy” were big numbers too, with “Uptown Funk” at the top of the play list. “The eighth grade students worked very hard in executing a wonderful event for their confirmation service project,” said eighth grade teacher Lorianne Davis. Other events during the week included Open House and an opening Mass on Sunday, Jan. 25; Family Feud students vs. faculty on Monday; Valentines for Vets in which kids made Valentine’s Day cards for patients at a veterans’ hospital; breakfast gift bags for bus drivers on Wednesday; bingo via the school’s PA system on Thursday; and an ice cream social on Friday. Although the Dance-a-thon is behind them, a group of students will visit Our Lady of Confidence on Feb. 19 to present their gift and hold a bingo game for the OLC kids. It all proves many of the very best lessons are not learned in the classroom. “Through the dedication of our eighth grade students and faculty and the donations from our school community, we have learned the true meaning of what it means to be a true and genuine Catholic – giving back,” eighth grader Luke Bearish observed.